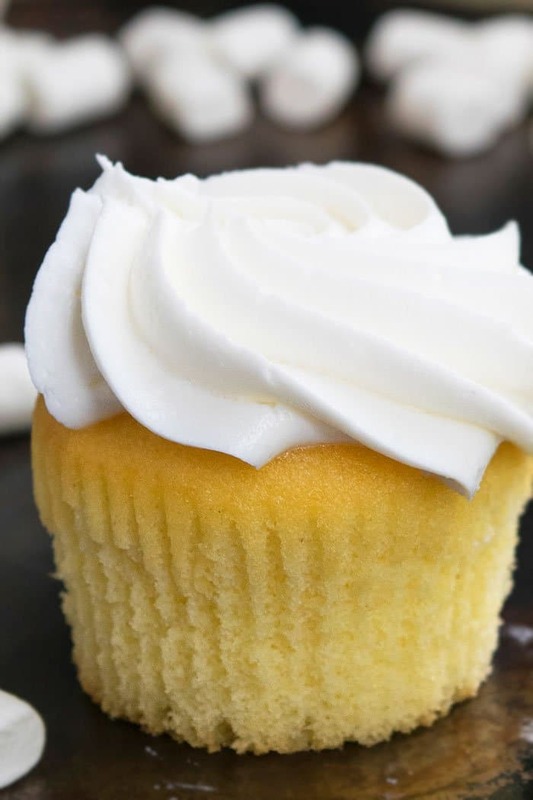 Learn how to make quick and easy vanilla cupcake recipe from scratch with vanilla buttercream frosting. 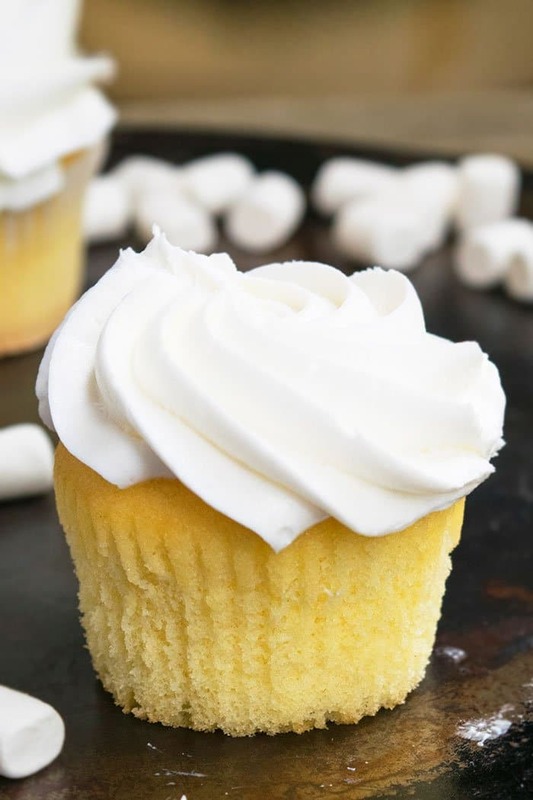 Classic, rich, soft, moist, light, fluffy, perfect vanilla cupcakes made with simple ingredients. This recipe never fails and is absolutely dummy-proof! They are a hit at birthday parties and weddings, just like my White Wedding Cupcakes. How to make best homemade vanilla cupcakes from scratch? Separately, mix together butter, sugar, egg, yogurt, milk, vanilla extract. Dump dry mixture into the wet mixture and mix until just combined. Frost them and you are done. Yes. Unfrosted cupcakes can be stored in an air-tight, sealed freezer bag or container for up to 1 month. Let them thaw in the fridge or at room temperature and then ice them with frosting. Moisture comes from rich ingredients that are high in fat. So, use full fat sour cream or Greek yogurt. Use whole milk instead of fat free or low fat milk. Use butter instead of oil. What makes a cupcake fluffy? That’s a result of the air bubbles that you whip into the batter in that end up expanding in the oven during baking. However, if the batter is over-mixed, those bubbles end up collapsing and the cupcakes don’t fully rise and can sink too. That’s why you should only mix the cake batter until just combined. Also, measure ingredients properly because baking is science and those measurements and ingredients combine together to create the best fluffy texture. All ingredients must be at room temperature so that they blend together smoothly and evenly. Use unsalted butter to prevent these cupcakes from becoming too salty. Don’t replace all-purpose flour with any other flour because it does not yield the same good results. Use whole milk and full fat Greek yogurt for maximum richness and moisture. If you don’t have Greek yogurt, a good substitute is full fat sour cream. Don’t over-mix this batter because that will yield tough cupcakes. Butter should be melted but not super hot because that would end up cooking the eggs when you mix it in the batter. Allow the cupcakes to fully cool down before frosting them because that prevents the frosting from melting all over the cupcakes and making a mess. You can tint the cupcake batter and make them fun for kids birthday parties but use gel colors instead of liquid food coloring to prevent the cake batter from becoming too runny. Don’t replace butter with oil because butter adds a nice rich flavor. You can use this recipe to make 24 mini vanilla cupcakes. Just use a mini muffin pan and mini cupcake liners. 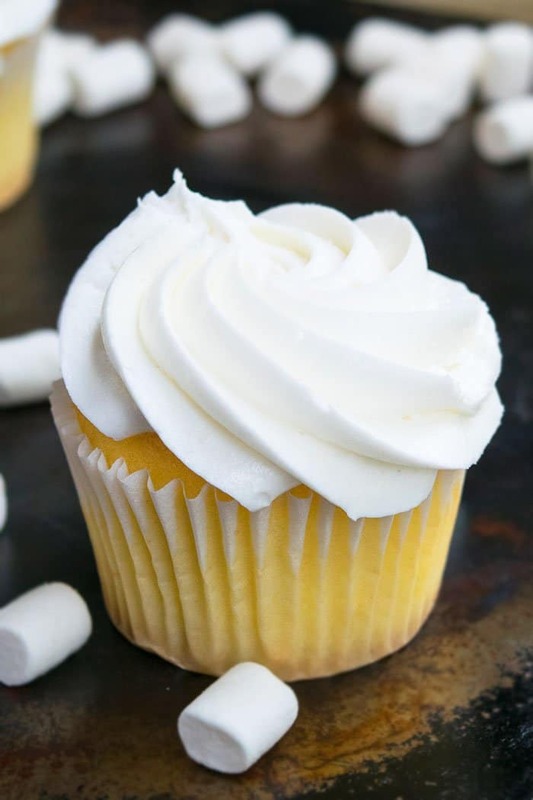 Vanilla bean cupcakes- Instead of vanilla extract, you can use vanilla beans, which have a stronger flavor and aroma but that will add little black specks in your cupcakes. You can also use a combination of both for a better flavor profile. 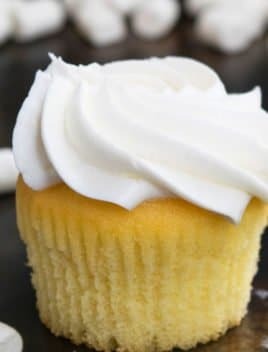 Learn how to make quick and easy vanilla cupcakes recipe from scratch with vanilla buttercream frosting. Classic, rich, soft, moist, light, fluffy, made with simple ingredients. In a large mixing bowl, whisk together the flour and baking powder. Keep aside. In another mixing bowl, mix together melted butter and sugar until combined. Add egg, Greek yogurt, milk, vanilla extract and mix until smooth. Dumpy the dry mixture into the wet mixture and mix until just combined. Bake at 350 degrees for 20-22 minutes or until an inserted toothpick in teh center comes out clean. Allow the cupcakes to cool down and then, frost each of them in a swirl of buttercream. Enjoy! Oh I am going to make these with my kids over the weekend- YUM! This cupcake looks absolutely delicious! Yummy! If I didn’t want to make cupcake but a 13×9 cake or like an 8 in round cake would ingredients vary and how long would I leave it in the oven for? 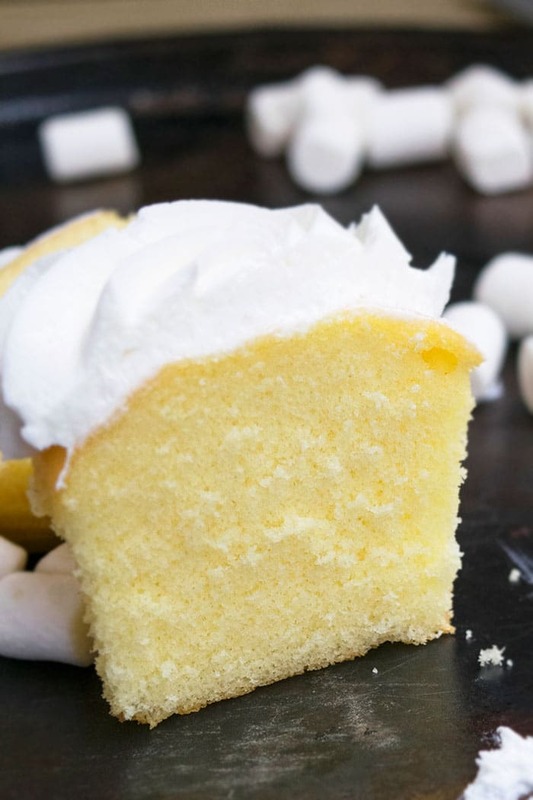 You won’t need to change the ingredients or their quantities but you would bake for 30-40 minutes or until an inserted toothpick in the center comes out clean. Keep a close eye after 35 minutes.